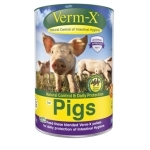 Home Verm-x Health Verm-x for Pigs. Verm-X Pellets for Pigs are designed to be mixed with daily feed rations. Along with the Verm-X herbal formulation, the pellets contain dicalcium phosphate, seaweed meal, limestone flour, sunflower oil and micronised sugar beet pulp for additional digestive fibre. A healthy digestive system is vital as 70% of the immune system is housed in the intestinal tract. Verm-X consists of herbs that have been used for centuries as a natural way to control intestinal hygiene in farm animals along with the many other benefits that will assist the health and growth of your pigs. Continuing our support for the smallholder, Verm-X for Pigs is supplied in quantities that are convenient for those who may have a small swine herd of 2 or 3 pigs through to the more serious pig breeder. Even pigs that are kept in the most free range of environments intestinal hygiene control is a vital part of their keeping. Infestations can be brought in by new stock, already present in grazing, passed on by wild animals and mixed grazing or carried on boots and clothing. Fed monthly Verm-X provides effectiveness that is convenient and offers continual control. Verm-x Pellets For Pigs. 750g.